This New Year began with reaffirming my resolution to regularly attend the Iyengar Yoga classes conducted at Nirguna Mandir located at 4th Block Koramangala, adjacent to ST Bed Layout. Apart from the significant improvement in strength, stamina and concentration that my weekly classes have provided, my primary motivation has been the steadfast guiding presence that my yoga teacher provides. Simple, unassuming, modest; these are the words that come to most of our mind when we think of K Mahadevaiah, our yoga teacher. But to me he epitomises all that is required to be an inspirational figure beginning with an unshakeable belief and faith in the work that he does. Inspite of successfully helping many of the students, he continues to be humble and modest – incapable of accepting even a ‘thank you’. His focus is completely on students and how they can ‘use’ him to their benefit. He remains in the background – teaching, directing and correcting. He simply teaches you that greatness resides among us as long as we know where to look. The system of ‘Iyengar yoga’ was created by BKS Iyengar based on the traditional eight limbs of yoga as expounded by Patanjali in his Yoga Sutras. The significant difference in the practice of this form of yoga is the use of props such as ropes, belts, bricks and benches to help the student get the intended structural alignment in an asana. Iyengar Yoga puts specific emphasis on those suffering from ailments such as back problem, joints pain, asthma, blood pressure, stress associated with modern day living, among others. The benefits of Iyengar Yoga on those with ailments can be seen firsthand in our class. One student who is in his forties and has been suffering from high blood pressure for the last 16 years says that he is able to control it with regular yoga and that his medications have been reduced by his physician. Another student, 34 years old and suffering from chronic asthma attributed to living in Bangalore, extols the significant improvement in stamina and ‘easy breathing’ that the classes have helped her with. Yet another student, Ajay, also in his thirties, came in just for ‘general toning and building strength’. In his own words "he was surprised with the resultant benefits which included "greatly increased strength in the back, arms, legs, hands" and with the fact that his "back never gives [him] a problem now". Last but not the least, the students of this class benefit from the Pranayama classes conducted by Nagaraja Rao, one of the students, on Saturday. Seven years ago, Rao was limping and was finding it difficult even to walk, having been diagnosed with Osteo Arthritis of the knee joints. After practicing asanas tailored for those with arthritis, he has gone on to win national and international level tennis tournaments in the Veterans Group of 65 years. Those interested can attend the Iyengar Yoga classes at Nirguna Mandir at 6.30 AM on Tuesday, Thursday and Saturday and at 6.30 PM on Monday, Wednesday and Friday. The monthly fees for three classes a week is Rs. 400. The classes are for both men and women. Despite protests from residents BBMP is yet to build a boundary wall around the drains that were opened up. NGV (Koramangala) residents had to bear the brunt of it during heavy rains last weekend. 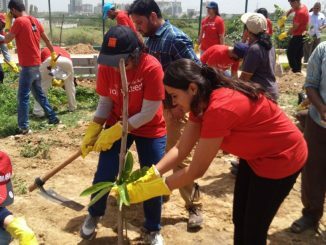 The celebrations commenced on 3rd June with over 1000 corporate volunteers dispersing 50,000 seed balls at the Bangalore University Campus. One year since BMTC launched ‘Bus Day’ to popularise public transport. What are the learnings so far?